Another journal has come my way from one of the group members who lives in England. Her name is Kalona and her journal theme is Magic and Mysteries I believe. I have only roughed out a sketch of what I am going to do. 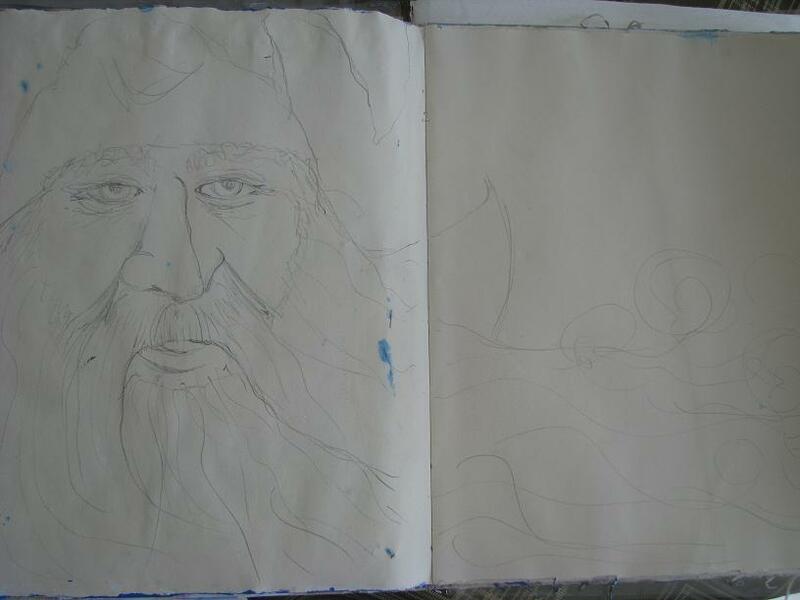 I decided to do a wizard and he will be completed using acrylic paints and prisma colour pencil crayons. I originally thought that I would portray him standing with lightning coming out of his hands and staff, but he told me was a tired wizard and wanted to be portrayed in an more gentle light. Funny how your art decides what it wants to be. I used to have that happen to me all the time when I was designing and making art dolls. I wanted a certain doll to have purple hair and there was a fight and she ended up with red hair…and NO…I am not “off my rocker”. So here he is. I have not thought of a name for him as yet. Completion to be saved for next week when all the grad ceremonies are over. I will post more pictures as I get closer to completing him and then a final reveal before mailing on to the next member.